Sleepless in Seattle is a 1993 American romantic comedy directed and co-written by Nora Ephron, based on a story by Jeff Arch. It stars Tom Hanks and Meg Ryan, alongside a supporting cast featuring Bill Pullman, Ross Malinger, Rob Reiner, Rosie O'Donnell, Gaby Hoffmann, Victor Garber, and Rita Wilson. Released on June 25, 1993, the film was a critical and commercial success, grossing over $227 million worldwide. After Chicago architect Sam Baldwin loses his wife Maggie to cancer, he and his eight-year-old son Jonah start a new life in Seattle, but they continue to grieve. A year and a half later on Christmas Eve, Jonah calls in to a radio talk show. Jonah persuades a reluctant Sam to go on the air to talk about how much he misses Maggie. Hundreds of women from around the country who hear the program and are touched by the story write to Sam. One of the listeners is Annie Reed, a Baltimore Sun reporter who is engaged to Walter but feels there is something missing from their relationship. After watching the film An Affair to Remember, Annie writes a letter suggesting that Sam meet her on top of the Empire State Building on Valentine's Day. She decides not to mail it, but her friend and editor Becky does it for her and later agrees to send Annie to Seattle. Sam begins dating a co-worker, Victoria, whom Jonah dislikes. Jonah reads Annie's letter and likes that it mentions the Baltimore Orioles, but he fails to convince his father to go to New York to meet Annie. On the advice of his playmate Jessica, Jonah replies to Annie, agreeing to the New York meeting. While dropping Victoria off at the airport for a flight, Sam sees Annie exiting from her plane and is mesmerized by her, although he has no idea who she is. Annie later secretly watches Sam and Jonah playing on the beach together. The next day she goes again to Sam's houseboat but mistakes Sam's sister for Victoria. He recognizes her from the airport and says "hello" but Annie only responds with "hello" before leaving. She returns to Baltimore and then goes to New York to meet Walter for Valentine's Day. With Jessica's help, Jonah flies to New York and goes to the Empire State Building searching for Annie. When Sam discovers what Jonah did, he grabs a later plane and follows Jonah where he finds him on the observation deck. Meanwhile, Annie sees the skyscraper from the Rainbow Room where she is dining with Walter and confesses her doubts to him, amicably ending their engagement. She rushes to the Empire State Building and arrives on the observation deck just moments after the doors to the down elevator close with Sam and Jonah inside. The observation deck is deserted, but Annie discovers the backpack Jonah left behind. As she pulls out Jonah's teddy bear from the backpack, Sam and Jonah emerge from the elevator having returned to fetch it, and the three meet. After Sam and Annie stare at each other in recognition, Sam says they should go and offers his hand to Annie. The three then enter the elevator together and the doors close. The film was originally to have been scored by John Barry, but when given a list of twenty songs he had to put in the film, he quit. 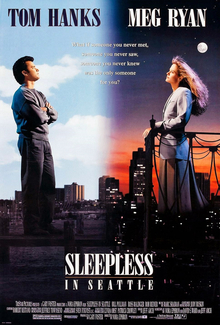 Sleepless in Seattle opened theatrically on June 25, 1993, in 1,579 venues, earning $17,253,733 in its opening weekend, ranking second in the North American box office behind the third weekend of Jurassic Park. At the end of its run, the film grossed $126,680,884 in the United States and Canada, as well as $101,119,000 internationally, for a worldwide total of $227,799,884. The film received positive reviews from critics. Review aggregator Rotten Tomatoes reports that 73% out of 56 professional critics gave the film a positive review, with a rating average of 6.61/10. The consensus states, "Sleepless in Seattle is a cute classic with a very light touch and real chemistry between the two leads -- even when spending an entire movie apart." On Metacritic, the film has a 72 out of 100 rating, based on 17 critics, indicating "generally positive reviews". The actors are well-suited to this material. Tom Hanks keeps a certain detached edge to his character, which keeps him from being simply a fall guy. Meg Ryan, who is one of the most likable actresses around and has a certain ineffable Doris Day innocence, is able to convince us of the magical quality of her sudden love for a radio voice, without letting the device seem like the gimmick it assuredly is. Vincent Canby of The New York Times called it "a feather-light romantic comedy" and wrote, "It's a stunt, but it's a stunt that works far more effectively than anybody in his right mind has reason to expect. Not since Love Story has there been a movie that so shrewdly and predictably manipulated the emotions for such entertaining effect." The film received two nominations for awards in the 66th Academy Awards (held in 1994). It lost out to The Piano for Best Original Screenplay while the song "A Wink and a Smile" lost out to "Streets of Philadelphia" (from Philadelphia, another Tom Hanks movie) for Best Original Song. The film was nominated for three Golden Globe Awards: one for Best Actor – Musical or Comedy (Tom Hanks) another for Best Actress – Motion Picture Musical or Comedy (Meg Ryan) and a third for Best Motion Picture Musical or Comedy. The film won four awards at different ceremonies. Ryan won the award for Funniest Actress in a Leading Role at the American Comedy Awards. At the 1994 Young Artist Awards, Malinger won the award for Best Actor Under Ten in a Motion Picture and the film itself won Outstanding Family Motion Picture for Comedy. The film is recognized by American Film Institute in AFI's 10 Top 10 as #10 in Romantic Comedy Film category and in AFI's 100 Years...100 Passions at #45 . In 2009, development began on a musical version of Sleepless in Seattle. David Shor was announced as the musical's producer, with a book being written by Jeff Arch, Shor's longtime partner and original story writer for the motion picture. Leslie Bricusse was initially attached to the project, but withdrew due to "creative differences with the show's producer and director". Michelle Citrin, Michael Garin and Josh Nelson were announced to be working on the music and lyrics, with Shor discovering Citrin via YouTube. The musical was initially set to release in 2010, with the premiere date later being moved to 2011 and June 2012. In February 2012, Shor announced that the musical would not premiere until the 2012-13 season and that the show would "undergo a top-to-bottom overhaul" and would have a new creative team. With a new score by composer Ben Toth and lyricist Sam Forman, the musical version premiered at the Pasadena Playhouse in May 2013. ^ "SLEEPLESS IN SEATTLE (PG)". British Board of Film Classification. June 17, 1993. Retrieved December 11, 2015. ^ a b c d "Sleepless in Seattle (1993)". Box Office Mojo. Internet Movie Database. Retrieved December 11, 2015. ^ "Weekend Box Office Results for June 25-27, 1993". Box Office Mojo. Internet Movie Database. June 28, 1993. Retrieved December 11, 2015. ^ "Sleepless in Seattle (1993)". Rotten Tomatoes. Fandango Media. Retrieved April 8, 2019. ^ "Sleepless in Seattle Reviews". Metacritic. CBS Interactive. Retrieved December 11, 2015. ^ Ebert, Roger (June 25, 1993). "Sleepless in Seattle Movie Review (1993)". Chicago Sun-Times. Retrieved October 13, 2015. ^ Canby, Vincent (June 25, 1993). "Review/Film; When Sam Met Annie, Or When Two Meet Cute". The New York Times. Retrieved October 13, 2015. ^ a b "Young Artist Awards (1994)". Retrieved January 15, 2016. ^ "AFI's 10 Top 10: Top 10 Romantic Comedy". American Film Institute. Retrieved February 5, 2018. ^ "AFI's 100 Years... 100 Passions". American Film Institute. Retrieved December 16, 2018.